We’ve put together some diagrams and explanations to help you, and some templates that you can download. The width of the spine will depend on how many pages your book is, and how thick the paper is. So you will need to have prepared your manuscript to know the exact measurement. If you use CompletelyNovel we will tell you what the spine width is as part of your book creation process. You want to make sure that your cover doesn’t end up with any white space along any of the edges. To do this you need to add a bleed measurement on to the trim size so your cover image is slightly larger than your final cover will be. These are the areas on the front cover, back cover and spine where all the key elements of your cover should go. Note that this applies to the spine, even if you have a very thin book, so do take this into consideration. Not complying with this might mean your book is rejected by the printers, or you might end up with a spine that looks misaligned. This is the distance between the ‘Safe area’ and the line where your book will be cut. It’s recommended that you don’t put anything important in that area, such as your title or author name, blurb or price. Keeping it clear also tends to make your book look more professional. This refers to the size that the cover will actually be when it is cut. You will mainly hear people referring to the trim size of the book when it is bound i.e. just the size of the front cover. In the ‘Image’ menu, select ‘Canvas size’ and change the width so it is your ‘width with bleed’. Look in the layers panel and open the guidelines folder. You will see that there are specific layers for the front and back covers too. Move these so that they are flush against the outer edges of the template and the gap in the middle will be the size that your spine needs to fill. Widen or narrow the width of the spine layer to get an idea of what your safe area will be, although it will no longer be exact. You can use the guides within photoshop to help you. Remember to hide or delete the guides when you finish. Use these if you are working with other software or already have your Photoshop file mostly set up. Place or paste these correctly-sized images to ensure that you meet the specifications. Photoshop is not particularly cheap so if you do want to get deeper into image editing you might prefer to go for a free alternative called Gimp. It’s got all the functionality you need and it’s worthwhile taking some time to find your way around it. You can download it here. There are some tutorials here to get you started, and also one on editing photoshop files. 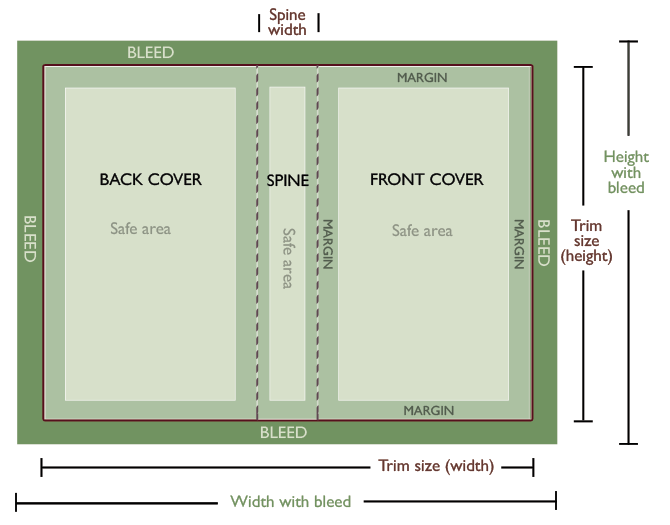 So, now you know about how to make your cover the right size. What else do you need to be aware of? Printers use different colour settings to screens. Make sure it’s set to CMYK rather than RGB to help ensure your colours come out as you expect. When you ‘Save as PDF’ or ‘Export as PDF’ from a graphics programme you should be able to specify the type of PDF you want. Look for the ‘PDFx 1A’ standard. This is usually the one you need. 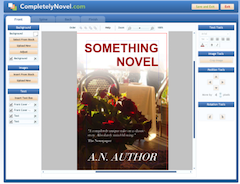 If you create a book on CompletelyNovel, we will guide you through our easy-to-use Book Creator. This process includes selecting your book size, uploading a manuscript, setting your price and the option to use our special Cover Creator. The Cover Creator is our free online tool that automatically loads a blank canvas with the correct dimensions for the front, spine and back covers – so you don’t need to download any specialist software and can focus on being creative! The Cover Creator will automatically generate the title of your book and your author name on the front and spine. Your blurb and ISBN will be generated for you too, and placed on the back. You can then place more text and images on top, change the fonts and play with the layout. To see how it’s done, watch this video. 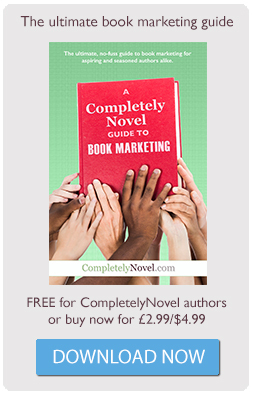 The Cover Creator is totally free for all CompletelyNovel users. Not a member yet? Find out more about how you join. You might want to upload a PDF of the entire cover directly to our system. There’s an option you can select to do this as part of the book creator too. 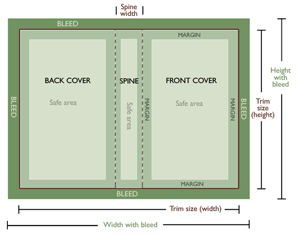 We will give you all the dimensions that you need to ensure your cover is the right size. This is a good option for people using PhotoShop or InDesign to create their covers. If you have any questions about saving as a PDF, we’re happy to help out – just contact us. You can also download the barcode to add to your cover. What makes an awesome cover? Your favourite book covers – results from our competition.